It’s great when the journey is every bit as good as the destination. Do you remember last week when I told you I could live on Caprese salads all summer, if only I could get my hands on good tomatoes all season? Well, that might have been a tiny stretch of the truth because I also adore a good BLT when the weather is really hot. And guess what? It’s really hot. And I’m aching for a BLT, but I’m still waiting for the perfect, juicy, ripe tomato. But thankfully, as I determined with my strawberry, mozzarella, and basil crostini, fruit can make an awfully good stand-in for tomatoes. We can have our bacon sandwich with whatever is ripe and juicy right now. This week it was nectarines. 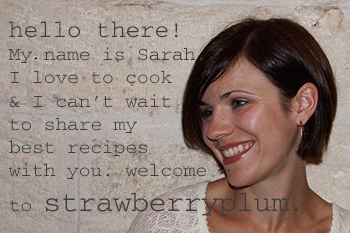 Let’s continue our delicious journey and build some bacon and nectarine sandwiches. We’ll start by reducing balsamic vinegar until it is thick and syrupy to drizzle over the nectarines. Next, cook up the bacon ’til it’s nice and crispy. 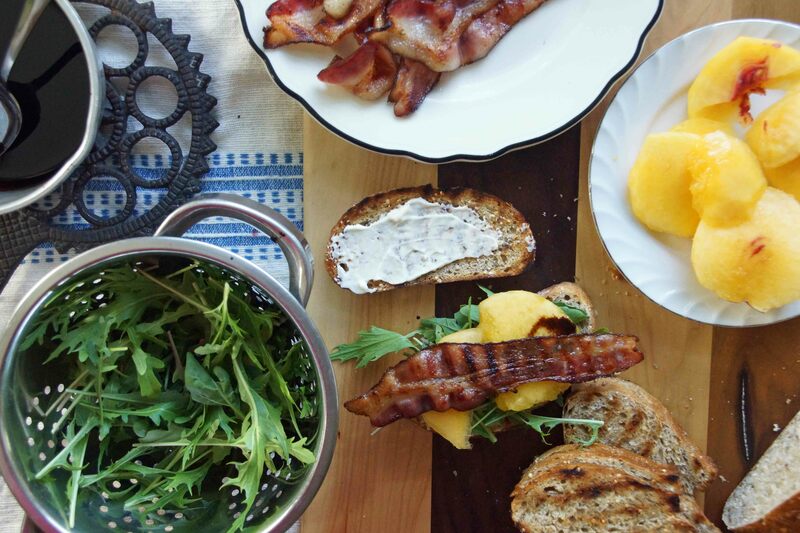 We’ll wash a handful of arugula, toast some bread, and slice a couple of nectarines. We’re ready to assemble! 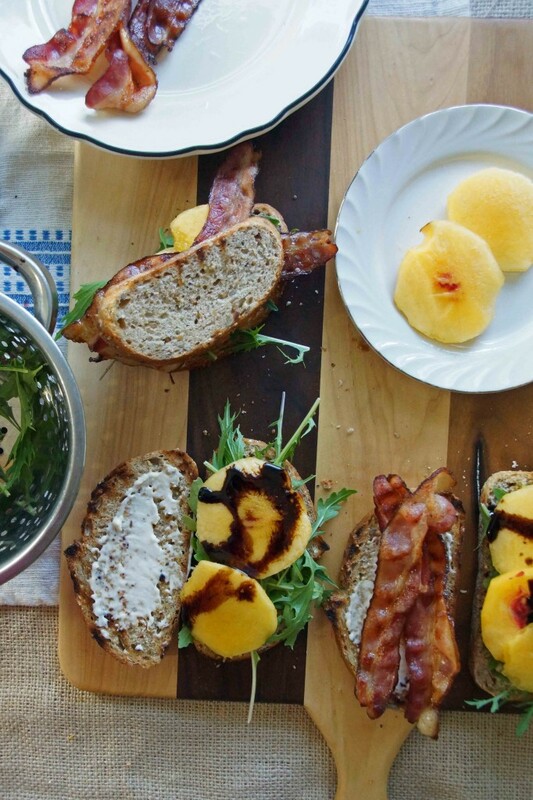 Spread each slice of bread with mayonnaise, then pile on the arugula and a few slices of nectarine. Drizzle with reduced balsamic vinegar and sprinkle with black pepper. Add a couple of strips of bacon and carefully balance another piece of bread on the top. Yes! Make the most of your hot weather eating with this delicious stop along the road to the perfect BLT. It’s summer living and I love it! 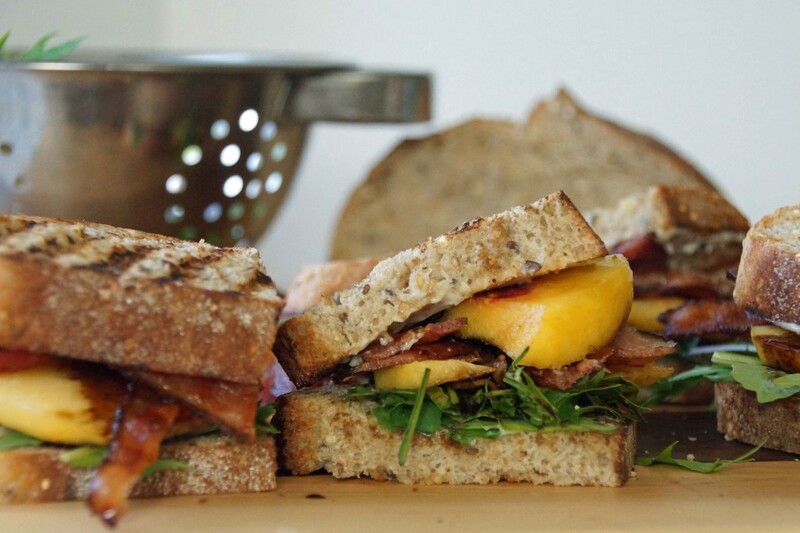 In a take on the classic BLT, the tomato is swapped for juicy slices of nectarine. Cook the bacon however you like. I like using a grill pan so most of the fat drains away. Toast the bread. I wiped my grill pan clean and used that to toast up the bread and add a touch more bacon-y flavor. Build the sandwiches. Spread each piece of bread with mayonnaise. Top with a handful of arugula and sprinkle with coarsely ground black pepper. Top with nectarine slices, red onions (if desired), and a drizzle of the reduced balsamic vinegar. Place the bacon over the nectarines and sandwich with the second piece of bread. Serve with plenty of napkins and a frosty root beer. ummm-ummm! What a great combination! Can’t wait to try it! 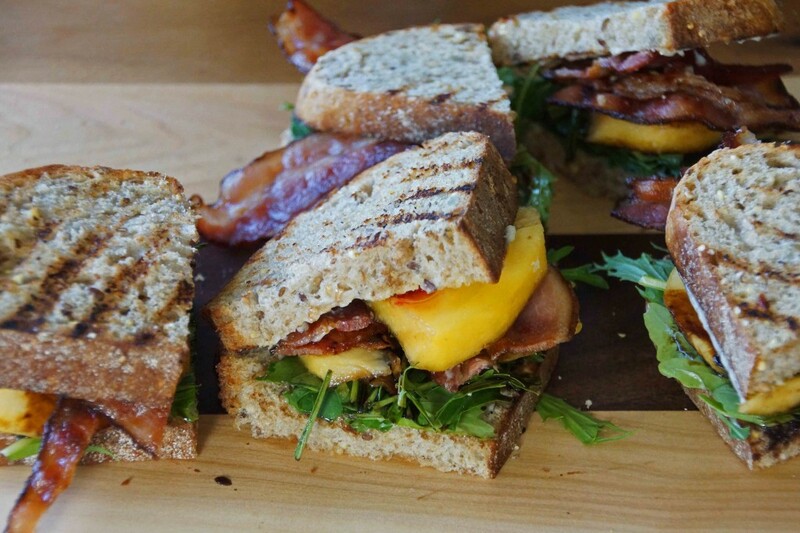 Love the twist of using nectarine in the sandwich.